A grand expanse of beautiful stamped concrete welcomes visitors to the award-winning Red Rock Casino Resort and Spa. Photos courtesy L.M. Scofield Company. Inviting walkways connect the hotel, pool area, restaurants, casino and conference center. Photos courtesy L.M. Scofield Company. The colors of the surrounding mountains and landscape accent the worn river rock pattern. Photos courtesy L.M. Scofield Company. - Over 100,000 sq. 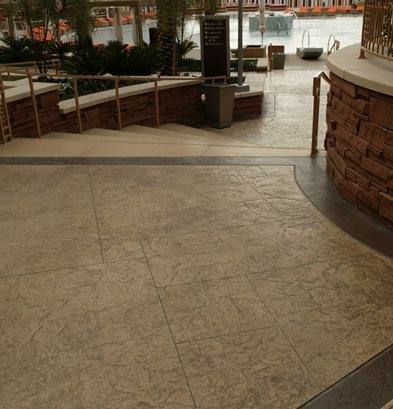 ft. of stamped & colored concrete installed at Red Rock Casino Resort and Spa. 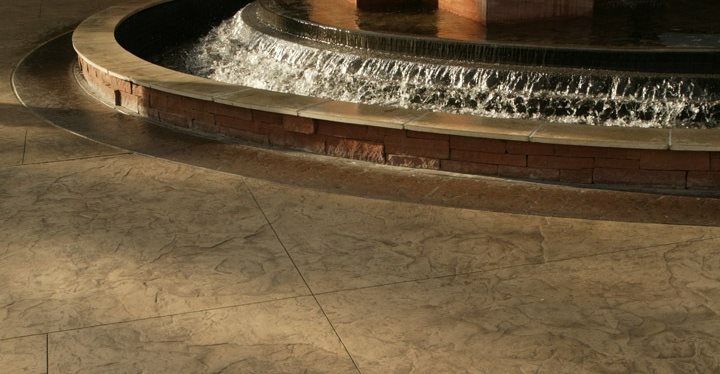 - Stamped concrete provides custom look while remaining extremely durable. - Color scheme inspired by surrounding Nevada landscape. 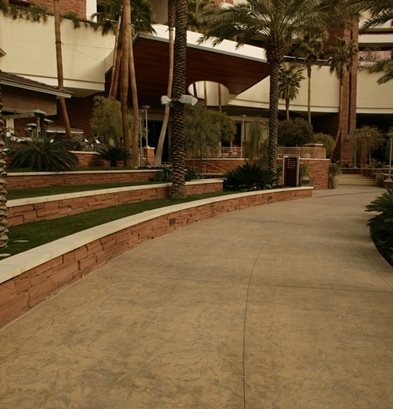 The dramatic and durable entries and walkways throughout the spectacular Red Rock Casino Resort and Spa in Summerlin, Nevada near Las Vegas were created using stamped concrete colored to reflect the natural desert hues. During the construction, ArCon Flooring installed over 100,000 sq. ft. of exterior colored and stamped concrete during a six month construction schedule. 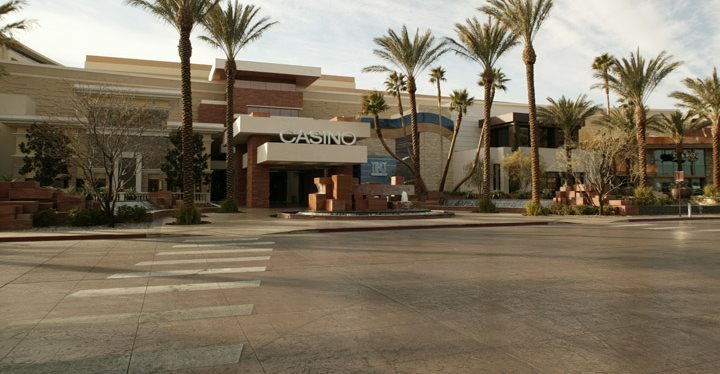 The owner, Station Casinos, wanted to use subtle colors and textures that would evoke the feeling of the nearby Red Rock Canyon National Conservation Area with its inspiring array of shades created by millions of years of oxidation and natural forces. The Nevada landscape provided the unifying theme for the award-winning "desert modern" architecture and interior design created by Friedmutter Group specifically for Red Rock Resort. The exterior hard landscaping and patios were designed to harmonize with the architectural style, as well as require minimal maintenance. The versatility of stamped concrete suited both the aesthetic and the practical criteria of the designers. According to the specialty contractor, Mark Balogh, President of ArCon Flooring, "The concrete has its own integrity. 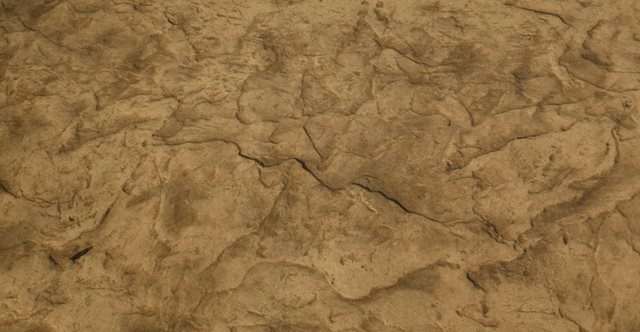 By using texturing mats to produce continuous patterns with a worn river rock texture, the concrete looks organic and works with the finest natural materials and stone building facades. The depth of the pattern aids abrasion-resistance and is aesthetically pleasing. We recreated the colors of the mountains, cliffs and the Mojave Desert by using color hardeners, release agents and in some cases stains. The stamped pattern shows off the subtle color variations." 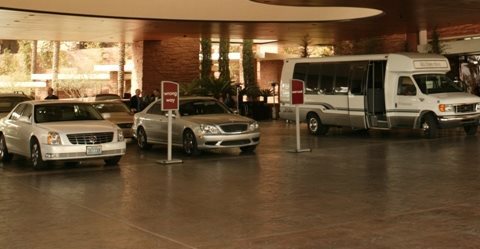 Situated on 70 acres in the northeastern Las Vegas Valley with a dramatic mountain backdrop, the magnificent $925 million dollar Red Rock Casino Resort and Spa is comprised of 850 guestrooms served by ten restaurants, along with a spa, nightclubs and bars and lounges which adjoin an 87,000 sq. ft. casino. Stamped and colored concrete walkways connect these areas as well as the 80,000 sq. ft. conference center. Both the interior and exterior are designed to produce a luxury entertainment and conference destination with a distinctly different character than the Las Vegas Strip. According to Mark Balogh, who has been constructing boutiques, restaurants and hotels in Nevada since the early '80s, the materials used in this market must change often to continuously offer up a new experience. Mark says the architects and owners of Red Rock Resort initially were opposed to the use of decorative concrete, because it is pervasive on the strip in Las Vegas as a medium used to create bright and gaudy fantasy floors and landscapes that look unnatural and other-worldly. However, after looking at many mock-ups and samples using natural colors, the beauty and versatility of concrete won out. The stamped, decorative concrete works beautifully alongside more costly materials. Photos courtesy L.M. Scofield Company. "Our R&D department at ArCon is constantly working to use common materials in uncommon ways. We strive to be the first to market. The trend of using concrete that looks like cobblestone may still be popular in residential use; but in the places we work, we cannot repeat ourselves. Here, each project is unique, yet we are using materials that are tried and true. That is the beauty of concrete. Massive projects like this are not the place to experiment. We are selling the reliability of concrete, and using it in innovative ways," Mark says. "The best part of my job takes place in the early pre-planning. During the design-assist, I get to present samples and ask the designer if they have considered these kinds of looks. I love to be involved at that stage when I can take the designer's creative vision and make it constructible on the schedule." Crews are working 24/7 to meet the tightest scheduling possible, and deadlines often are moved forward. There are landscapers and pool contractors vying for the space, too. On a job of this scale and magnitude, delays would cause massive problems. It is not unusual for ArCon to have a crew of 100 to150 people on site on any day. ArCon has over 40 people just in management and safety to deal with the special requirements of this type project. Balogh says, "Hotels and casinos are a challenging workplace. Sometimes it feels like highway gridlock on site. When we have people installing toppings on balconies with no railing, we have to know exactly what we are doing. We also do our own internal training regularly." The colored stamped concrete delivers durability for both pedestrian and vehicular areas. Photos courtesy L.M. Scofield Company. At the Red Rock project, ArCon selected continuous pattern stamp tools to accommodate a fast moving installation schedule, but still achieve a high-end, custom look. The stamp tools were rotated in different directions during imprinting so that the pattern never seems to repeat. Saw cuts were used for expansion and to vary the pattern further. Incorporating a ready-to-use, dry shake hardener into the surface of the wet, plastic-like concrete surface followed by use of a colored powder release agent on the tools, produced an antiqued appearance that has subtle shading. The color hardener improved the density of the surface for better long-term wear. The colored release agent provided crisp imprints and easy tool removal. The color of the release agent became imbedded in the deepest recesses of the pattern which accentuates the pattern details and depth. These materials provided permanent and non-fading colors which were sealed to improve stain-resistance from spills and environmental conditions. Since its opening, Red Rock Casino has experienced such unprecedented success that the second phase of construction was accelerated. 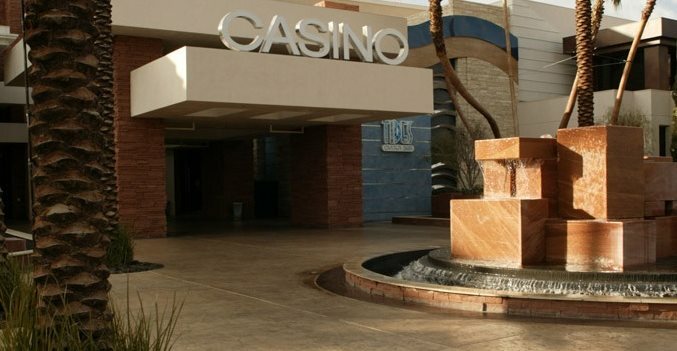 It provides a location for conferences, meetings and vacations, as well as an evening entertainment option for Nevada residents who prefer something away from the hubbub of the Strip. Friedmutter Group Architectural & Interior Design Studios received four awards from the American Gaming Association's G2E Institute for its design work on Red Rock Casino Resort and Spa. Although Red Rock is award-winning, it remains a quiet success story - and perhaps that is what was envisioned.